Totopos is the name that is given in Mexico to the tortilla pieces that have a hard and crispy consistency. Generally their shape is triangular and they vary in size. In this recipe as the tortilla chips are fried, they acquire more flavor and a beautiful golden color . 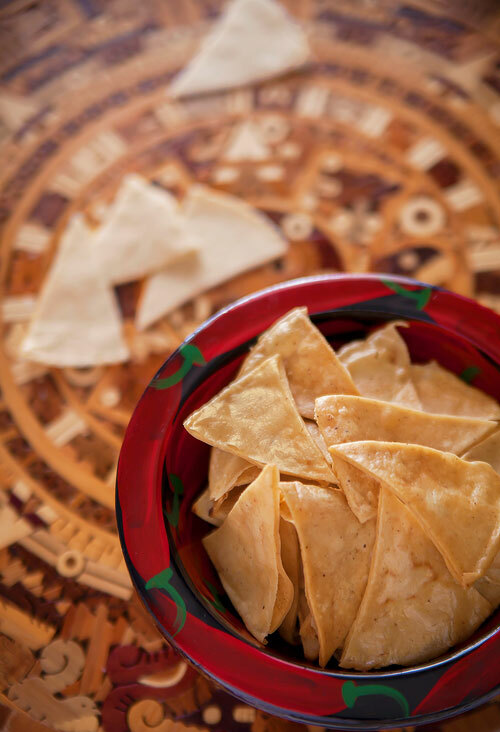 These tortilla chips can be served as snack in parties or reunions. However they cannot be served plain, they have to be accompanied with a salsa or dip like: green salsa with avocado , red salsa , chipotle pepper salsa , guacamole , black bean dip , parmesan cheese chipotle dip , etc. Your friends will love them! But that’s not the end of the fried tortilla chips’ functionality since they can also be served accompanying main courses like: ceviche , Veracruz style fish , chicken in adobo , etc. And to close with a high note wherever you see refried beans , that’s the perfect place to stick some tortilla chips. This recipe is very easy to make and it is also very cheap. If you have old tortillas use them in this recipe because they absorb less fat when they are fried. It is very important to use vegetable oil to fry the tortillas, in this recipe because it resists very high temperatures. The recipe is for 1 basket of fried tortilla chips. Cut 6 corn tortillas into equal triangles, then reserve. You can also cut the tortillas into small rectangles. This type of tortilla chip can be used to garnish soups and salads. Pour in a frying pan approximately 1 cup of vegetable oil, so you end up having about a 1/2’’ deep oil layer. Then heat the oil over high heat. Submerge in the frying pan the tortilla triangles that were cut (just the ones that fit in) and fry them for about 2 minutes, until they are well fried; move them occasionally with some tongs. Transfer from the frying pan to some paper towels, with the tongs, the tortilla chips that were fried so they dry and the fat excess is absorbed. Sprinkle over the fried tortilla chips that were dried, a little bit of salt and serve them. Repeat the same procedure with the tortilla triangles that were not fried, it won’t be necessary to add more vegetable oil in the frying pan. Tip: Present the tortilla chips in a basket covered with colorful cloths , they will look very beautiful and very Mexican. Suggestion: If you want to enjoy something simple and delicious; just put lime to these tortilla chips. Variation: The tortilla chips can also be baked. Did you like the Tortilla Chips? To make the tortilla chips you can use “La Banderita Corn Tortillas" because they are of very good quality and they fry to perfection. To make the fried tortilla chips you will need some good tongs as the Norpro because they are long, resistant, they have a good weight and they have a firm hold. You can serve the tortilla chips in a Mexican basket as beautiful and as colorful as this one.